Paper bag puppets are certainly not a new idea, but around Halloween the time white lunch bags make a great ghostly craft to make with your kids. 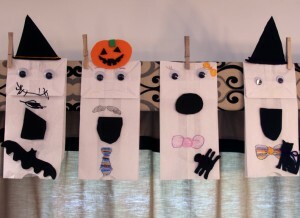 With just a few crafty supplies you can make these cute little ghost friends. I used hot glue to attach the witch hats and ran a piece of yarn around the base of the hat for a little Halloween fun. The pumpkin, mouths, and bat are also just cut out of black foam. 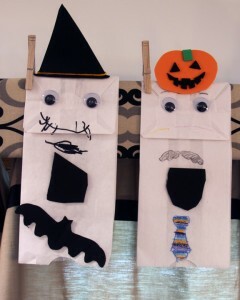 The kids had fun coloring mustaches onto the boy ghosts. The girl ghosts got cute eyelashes and little bows. The spider and black cat have little purple yarn bow ties just for fun. These were a very easy, but an exciting craft for the kids to make. They are so cute that I clipped them to our window valence using clothes pins to make them a fun little piece of Halloween decor. 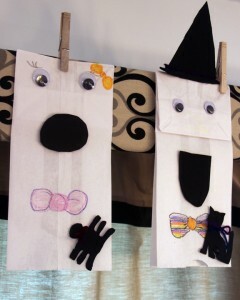 The kids love seeing them displayed, and love to take them down and play with them as puppets too. An old-school craft ideas for your little monsters!